Whenever we buy anything we are telling manufacturers and producers we are OK with how they package it, how they market it and even how they produce it. You may have heard the term “voting with your pennies” well that’s what it’s referring to. Each purchase you make comes with social, environmental and economic impacts. Coffee is no exception to that. I am a coffee addict. To be honest I tend to buy the coffees I know I like; I buy fresh but I always have a jar of instant around too. I don’t know if I ever made a conscious decision about which coffee to buy based on anything but cost and taste. 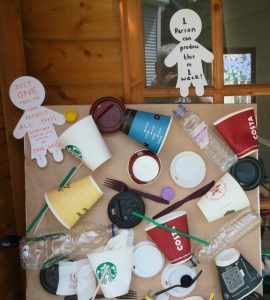 Until we started collecting thousands of Tassimo T discs a month (thanks to Terracycle for enabling us to recycle them) I hadn’t realised how much waste one cup of coffee could generate. It made me start to wonder about the differences between all the options we should be thinking about when buying coffee. 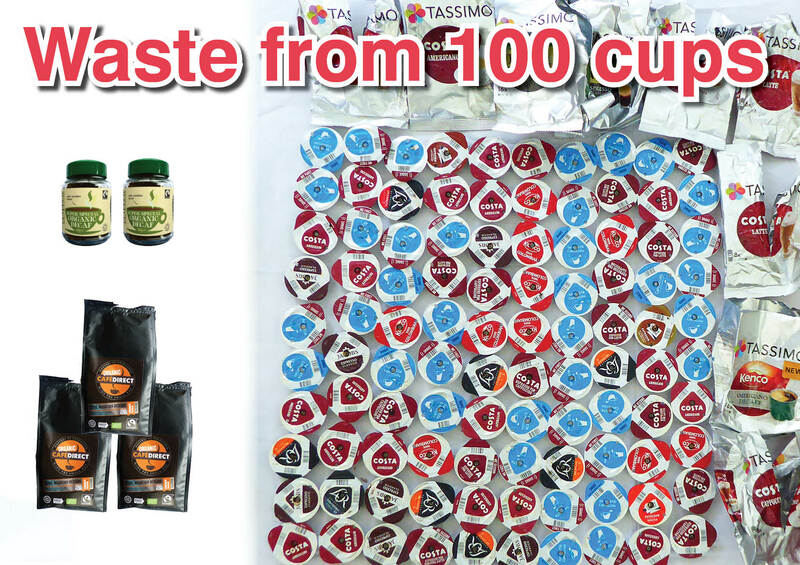 The only reason we have “singled out” Tassimo T discs for this blog is because we are currently collecting them but we suspect that other brands of coffee discs will yield similar results. The other thing you need to know is that this blog only looks at the waste generated by the consumer and not the many stages involved before the coffee even gets to our supermarket shelves. 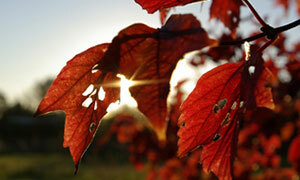 For many people the most influencing factor, whether or not you want to admit it, will be cost. 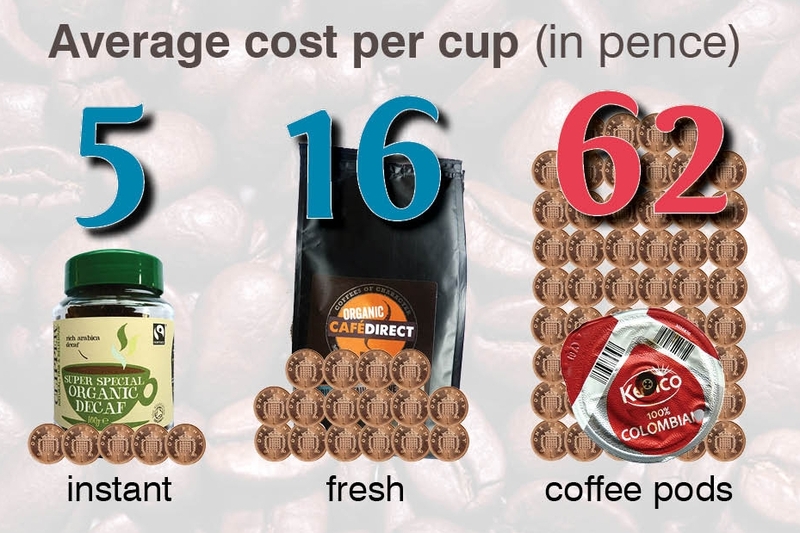 As you can see from the graph, Tassimo T Discs work out as the most expensive way to buy coffee with instant being the cheapest at only 5p per cup on average. 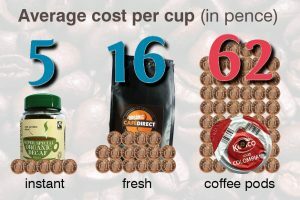 Whilst it may not surprise you to know how cheap instant coffee is, it definitely surprised me how expensive coffee pods could be. 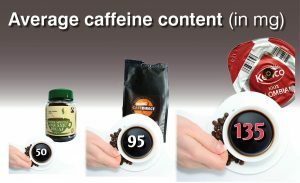 This can vary a lot but going by the instructions on packaging, instant coffee generally has the lowest average caffeine content at 50mg whilst Tassimo T discs have the highest at 135mg regardless of whether it is a latte, cappuccino or espresso. I’m not sure why Tassimo have chosen 135mg across the board but maybe it is to simplify the manufacturing process. Now as I confessed earlier I am a coffee addict but what I should really clarify is that I am addicted to caffeine. How do I know? Well on the few occasions I have tried to give up coffee and therefore caffeine I have felt sick, tired and suffered the worst headaches I’ve ever had. Within an hour of relenting and having a coffee I’m fine. Now say what you want about my will power and the potential psychosomatic effects but it is well documented that caffeine can cause insomnia (everyone has different caffeine sensitivities so you may not even notice this… I know I don’t). The “safe level” of caffeine used by many doctors and health experts is 300mg. You may remember a few well known chain coffee shops getting in trouble for exceeding that figure in one cup, but you can see how easy it would be to go well over that 300mg. Other “side effects” linked to caffeine are; heartburn, anxiety and it has even been linked to increased osteoporosis. If you’ve never had anything to do with a coffee pod system you may not be aware that to make the coffee (especially the flavoured barista style drinks) you’ll need more than one pod. One tends to be the coffee whilst the other is usually the foam/flavouring. My suggestion that standardising the caffeine content is to simplify the manufacturing process is based on that two pod system – if all coffee is the same and the flavours/foam are in the second pod you can cut down on your manufacturing and associated costs. That might be a slight tangent but I think it is relevant for the final point. On average, a 200g jar of instant coffee will make 100 cups of coffee. From that 100 cups of coffee you’ll end up with one medium sized clear glass jar which can be recycled through most kerbside recycling services. With fresh coffee, a 200g bag/packet will produce 30 cups of coffee and you’ll be left with one piece of usually, un-recyclable but upcyclable waste (more on that later) Tassimo on the other hand requires at least 1 pod per coffee but in most cases actually two. So to make the same number of black coffees (to make it fair) as you could from one packet of fresh you would have 30 plastic and foil pods. The pods themselves also come in a plastic/foil bag so you have another item of waste to consider. Depending on what’s available in your local area there may be shops in your town that will let you buy fresh coffee either in your own containers or in paper bags. In York we are very lucky to have a number of shops that will let you do just that. Only you can decide which coffee tastes better to you but anyone can see which of the listed options generates most waste. In our occasional surveys of people who kindly bring Tassimo pods to us very few them actually said that they love the taste; usually they’ve been given the machine and feel they have to use it. At least we can recycle the Tassimo branded pods and packets at St Nicks (for now, the recycling programmes do change!) so thank you to anyone that brings them in for us. We would be even happier though if this blog post might convince some that they can do without Tassimo machines. Reducing and refusing waste in the first place is even better than recycling. Great post! Recycling coffee capsules is rapidly taking off, with suppliers and organisations such as yourself. Life you say reducing the waste in the first place is the best strategy. I found your website whilst looking for a way to recycle Taylors coffee pods/capsules. Do you recycle all pods? Looking at your info I guess the answer is no. Am I wrong? and if so do you know of anywhere else I can send them. I’m don’t believe there is a way to recycle Taylors coffee pods, a few companies (such as Nespresso) allow you to post the pods back to them for recycling but I can’t find any information on the Taylors website about recycling theirs. You could try writing/emailing them to see if they can offer that kind of service? Great blog post, very interesting. Just wondering where in York do you get your ground coffee from in paper bags? Also you should speak to your web developer as its not easy to share your blog, you have to copy the link then paste in fb/twitter etc. On a separate note I am really interested in the eco home event on Sep 24th but unfortunately I’m teaching Reiki that day. Do you have any more planned? Thanks for getting in touch. Coffee as you describe can be purchased from the Perky Peacock or Alligator. We only tend to run our Eco Open Homes events once a year so please keep an eye on our website for info on the next one if you can’t make it this year.